Stone Coated Steel Is Often Designed To Mimic The Appearance Of Other Roof Materials. The finished look of a metal roof is commonly the top worry for our clients who are home and business owners. While many clients appreciate the stylish appeal of metal roofing, other clients want a more traditional appearance that may have the same benefits of a higher quality material. Fortunately, there is a material on the market that provides you the best of both worlds: stone coated steel. Want to learn more about stone coated steel roofing in Texas, Louisiana, and Mississippi? Make sure that you contact us at (833) 200-0571. Our experts at ECO Commercial Roofing have years of experience and we are happy to assist you! Why Choose A Stone Coated Steel Roof? Stone Coated Steel Is Available In A Wide Array Of Styles And Colors! There’s not a doubt that you’ve already heard about the many bonuses that come with the installation of a metal roof to your property. With metal roofing, you can look forward to extended longevity, wind resistance, and an array of styles and colors to fit exactly what you’re looking for. But when it comes to stone coated metal, you can have all of these perks while having the appearance of traditional shingles or tiles. 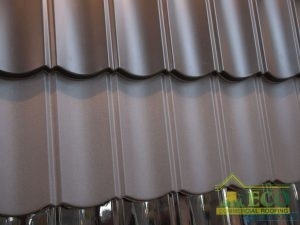 The intricate techniques of putting small stone chips atop metal roofing material give us the capability to make lightweight panels and style it to emulate conventional residential roofing styles. And even adding to this, you also receive as much as a 50-year warranty. 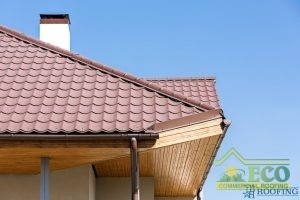 Now it shouldn’t come as a surprise that a high-quality roofing material, such as this, comes with a considerable price tag initially. But keep in mind, the stone coated steel can easily pay for itself with all of the extra benefits that come with it. These roofs demand less maintenance and are less susceptible to damage, which saves money on repair costs. Not only that, you’ll be saving money on your heating and A/C bills. Do you still need more persuasion on why you should upgrade to stone coated steel roofing in Texas, Louisiana, and Mississippi? Give us a call at (833) 200-0571. The ECO Commercial Roofing team is fully certified, insured, and waiting to help you!